The American Medical Equipment AME4700ROT Rotational/Low Air Loss Mattress combines True Low Air Loss with Full Body Lateral Rotation capabilities in a complete mattress replacement system. 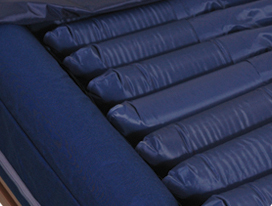 The purpose of the AME4700ROT True Low Air Loss Mattress System is to provide a full body lateral rotation and a therapeutic benefit to patients at risk or suffering from pressure ulcers. The microprocessor controlled blower unit features up to a 40º “Full Turn”, and “Right Turn” modes of rotation. These rotation modes have a minimum cycle time of 3 minutes and a maximum of 90 minutes. The “Turn & Hold” feature allows the caregiver to rotate the patient to the left or right to help administer the patient. Additional features include: “Static” for stationary low air loss therapy, “Auto Firm” for rapid inflation and easy patient transfer and “Lockout” to maintain caregiver settings without accidental interruptions. 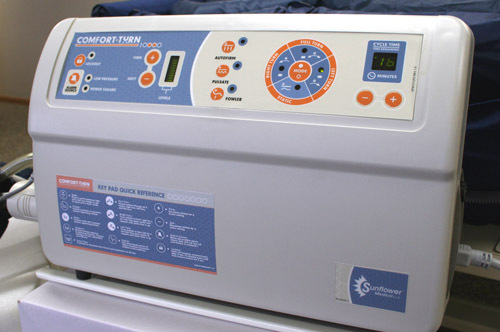 The AME4700ROT is a domestic mattress with 20 interchangeable air cells that are incorporated with a side support bolster which cradles the patient when rotating. The entire system is contained in a durable woven base, and the polyurethane coated top cover is waterproof yet highly vapor permeable. 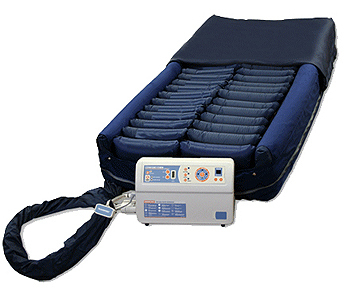 The entire system is portable and fits most standard medical bed frames. 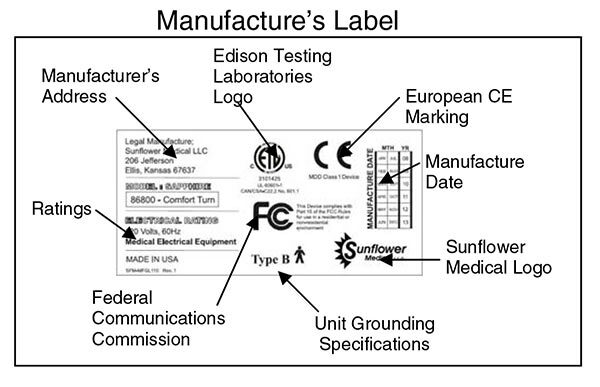 Additional features include: "Static" for stationary Low-Air-Loss therapy, "Fowler" to boost seat inflation when the head is elevated, "Auto Firm" for rapid inflation and easy patient transfer, "Lockout" to maintain caregiver settings without accidental interruptions, "Low Pressure" and "Power Failure" audible / visual alarms, and "Self Diagnostic Check" to quickly assess all switches and sensors for proper calibration & operation. 1. Remove standard mattress from the bed. 3. Strap air support mattress to bed frame on all four sides. .
4. Place control unit on the foot board of the bed using the two retractable hooks located on the back of the unit. (If no foot board is available, put blower on the floor away from traffic.) To avoid blocking the air intake, DO NOT place control unit on its back. 5. NOTE: (110V unit ONLY) Plug unit into grounded 110V A/C outlet. NOTE: (220V unit ONLY) Plug unit into grounded 220V A/C outlet. 6. Press the Auto Firm button for quick inflation. 7. 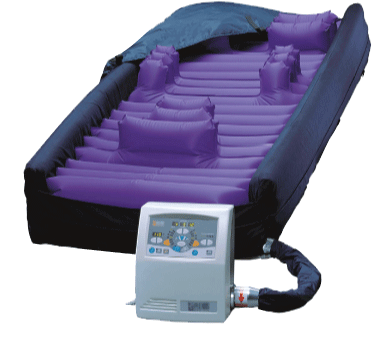 Place the patient on the bed after inflation to insure the air cells do not become twisted or kinked.